The first and only diet pill specifically developed to help menopausal and perimenopausal women lose weight. Estrin-D is clinically shown to increase resting metabolic rate, boost energy levels and increase stamina in menopausal and perimenopausal women. Estrin-D helps overcome your physical and emotional changes. So, for the first time in a long time losing weight is easy. The first and only "diet pill" specifically designed for menopausal and perimenopausal women. MENOPAUSE…It's more than hot flashes and mood swings. It's about gaining weight. You exercise... you barely eat... and you still put on the pounds (in places you never gained weight before). Estrin-D™ is clinically shown to increase resting metabolic rate, boost energy levels and increase stamina in menopausal and perimenopausal women. And Estrin-D™ helps overcome your physical and emotional changes. So, for the first time - in a long time - losing weight is easy. 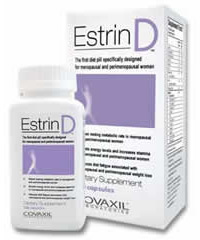 Estrin-D™ was designed specifically to address weight gain in menopausal and perimenopausal women. In addition to its patented weight-loss compound, it contains a proven hormonal balancing agent shown to reverse mood problems in post-menopausal women. Because Estrin-D elevates mood and helps stabilize your hormonal and emotional fluctuations, you'll not only look great, but you'll feel great, too!